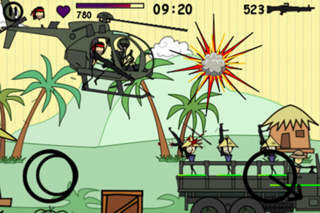 After completing the Boot Camp tutorial you are ready to face the enemies as a true soldier of the Doodle Army. Your quest is to exterminate as many of the enemies as you can before succumbing to their multitude. Your weapons range from pistols to sniper rifles, grenades, chainsaws, lasers and the ultimate flamethrower. As you find your character somewhere in Vietnam, Normandy, Zombie Town or even Mars, remember just one thing � shoot!